Originally appeared in Jacobin as "A Permanent Infrastructure" on February 15, 2018. We're going on tour in October! Visit our All In tour page to find an event in your area. The current crisis in US politics feels like irreconcilable differences based on race and gender. The meanness, partisanship, and division conveyed across media, practiced seemingly for electoral advantage, reveals a profound moral crisis building for decades. Despite what it seems, Dr. Martin Luther King, Jr, described the dynamic: "The tensions are not between the races, but between the forces of justice and injustice; between the forces of light and darkness." As a democratic socialist, radical democrat and human rights leader, Dr. King understood what these kinds of media portrayals and personal invective also hide: the economic injustice at the root of our inhumanity. We could talk about this crisis in many ways, but taking Dr. King as the touchstone, this Jacobin article addresses the injustice he found most inhumane: healthcare denied. Though written a few months ago, the following piece speaks to the on-going importance of building a justice-based Medicare for All movement for the upcoming election and beyond. Put directly, there is no health without justice, and there is no justice without health. Other historical moments when we went down the wrong path stand out. We could have fought for and potentially won this demand in 1993, having also failed in 1978. In 2009, we knew the solution but lacked the leadership and mass mobilization to push it. At each point, Democrats controlled Congress and had the Presidency. Now is OUR movement's moment. The GOP’s failed health care reforms, the Affordable Care Act’s unsustainability, and Medicare for All’s popularity have turned the call for single-payer health care into a rallying cry that unites the Left and even many liberals. Turning this moment into a movement that can win true health care justice will force us to answer some basic questions. What role will the market play in health care? What about the government? Who decides how to contain costs? What real solutions can we find to health disparities and structural determinants of health? As we answer these questions, we must present health care as a public good, one that deploys the collective resources of our society to protect and enable us to lead happy and productive lives. It’s easy to villainize the insurers who make money by denying care, but building the movement we need and basing it in people’s everyday experiences means shifting the debate from insurance to health, from policy to economic interest, from individual solutions to solidarity. The demand for Medicare for All should become a litmus test. Do you stand with the people or with the wealthy special interests that buy our politics and policy? We must ask our elected representatives if they will ensure our life, liberty, and pursuit of happiness or if they will abandon us to the bottom-line decision making of anonymous bean counters. As we see defensive fights across the US the question becomes how do we turn the energy and fear that continues to erupt in one off actions or rallies into work on offense? How do we organize resistance into permanent infrastructure that will challenge the status quo? The answer lies in melding strategic civil resistance, leadership development, and bottom-up organization building with distributed outreach, electoral campaigns, and legislative fights. Reclaim Chicago, a joint project of People’s Action, The People’s Lobby, and National Nurses United (NNU), exemplifies this new style of organizing. Combining mass mobilization with sustained leadership development, Reclaim Chicago has won campaigns, elected real progressives, and held politicians accountable. It has scaled up from municipal elections to statewide fights and the presidential election. During these struggles, Reclaim Chicago has built super-volunteer capacity, turned out larger and larger groups for canvassing and phone banking, and used digital strategies to extend its reach. Similarly, the California Nurses Association / NNU and the campaigners in Healthy California, Our Revolution, and Knock Every Door have visited thousands of homes, obtained tens of thousands of commitments, built an ongoing capacity in districts throughout California in support of the state-level Medicare-for-all bill, SB 562. This alliance has educated the public through town halls, public hearings, a mini-occupation of the state capitol, and visits to district offices; these actions have generated media attention and put pressure on elected officials. The group uses email, conference calls, peer-to-peer texting, and phone banking to identify new leaders and organize new constituencies, especially young people, Latinos, and resisters ready to play offense. 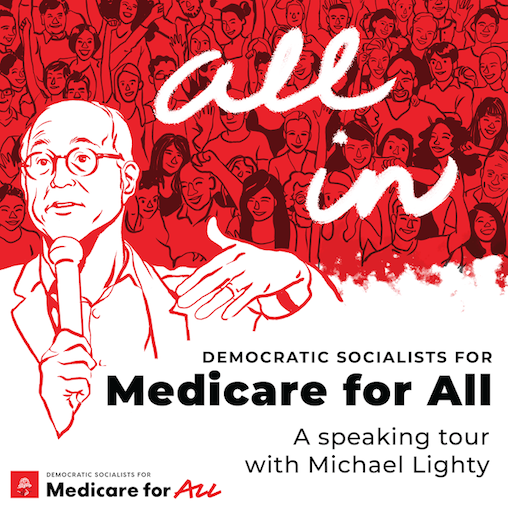 Reclaim Chicago and the activists in California show us how we can use storytelling, outreach, and organizing in disproportionately affected communities to link the demand for Medicare for All to broader justice struggles. Building these connections will allow the MFA movement to address not only the economic problems with our health system but also the race-based barriers to health and the structural causes of poverty, inadequate housing, and low-quality education that create chronic health conditions and drive up health care costs. If successful, the MFA movement could connect those who don’t have subsidized health insurance — the ones complaining about government handouts — with those who have subsidized health insurance but lack health security. It could unite employed people who can’t afford their deductible with Medicare recipients struggling to cover their co-pays. It could convince a union worker that she can’t keep her health benefits unless everyone else has them, too. And, with luck, it could motivate millions to demand more of the society in which they live.